The primary aim of the Master Link TeleSales Module is to enable the user to be able to enter an order as quickly as possible whilst the customer is on the phone. It offers the operator a telesales list of products specific to that customer, a special offer list etc. It provides a front office order entry interface, utilising the award winning Exchequer Enterprise for the back office order processing and accounts functionality. It may be used as a TeleSales module from within Exchequer Enterprise or used in conjunction with either of the two most popular Customer Relationship Management packages (CRM) on the market - Goldmine or Microsoft CRM. The CRM, such as FrontRange Goldmine, may be used to hold customer information, such as scheduled calls, e-mails, linked documents, transaction history to drive a TeleSales environment. Master Link Telesales moduel is FAST AND EFFECTIVE. Selecting stock by entering the stock code. Selecting a heading from the Exchequer Enterprise stock tree and drilling down to stock items, which are below the heading, for quick and easy selection. A window, at the top of the screen, shows detailed information on each stock item. This detailed information may include alternative stock codes (if the selected item is out of stock or discontinued) or suggested accessories (batteries, cables, etc). Allowing the user to search for stock by ANY WORD on the stock record. Additional words may also be added – in the background to the database by specifying them in the stock general notes. These background words are not normally visible and may be abbreviations, short forms or misspellings. Displaying a list of items, which are currently on special offer. Any number of special offer lists may be created. These lists may be linked to customers of a certain type. Any selected item displayed on the history screen shows all previous buying patterns of the item to the customer. Bespoke lists of products, may be set up displayed in a two level tree, for quick selection. These lists may be linked to customers of a certain type. Credit card orders may be processed or cached to file for credit validation. Designated users may process the batch of credit card transactions immediately or by batch. Place orders (SOR), which are paid by credit card payments (SCR). Provides matching routine to match off the two transactions when invoiced. Grid columns may be re-arranged and stored. Four layouts may be stored to allow the user to quickly change the display (to display the value of order, history, full description etc.). Colour may be customised to highlight lines of certain types. Automatically apply delivery charges based on transaction value, distance, weight of order or cubic size of stock item. Multiple delivery addresses may be stored in Goldmine (Contacts Tab) or TeleSales Delivery Database. Link stock items to web pages or documents for detailed information. Link stock items to accessory items, such as batteries for a TV remote. Link stock items to a group of alternative items to out of stock lines. View back orders (SOR & POR’S) for stock item. Warn if item margin is lower than x%. Search for any word on stock record or supplementary words. Customise the word search to search certain fields, such as by user 1 and user 2 on stock record. Exchequer Enterprise is used as a back office sales order and stock processor. Collections may be entered as quotes and converted to credit notes in Exchequer Enterprise. Shows customer history on all tabs, plus history in tree, search and transaction views. Warns if customer already has stock item on order. Display outstanding orders for customer quickly. Customer orders may be entered and saved to file and reloaded at any time to enable Customer to complete or confirm order at a later time. Tracks van delivery route totals by weight or cubic capacity for the day. Warns for theoretical pallet qty. Use “call identification” to pop customer details up on screen when they call in. Schedule telesales calls for operators. Import leads from text files. Use Goldmine to hold small turnover or single transaction account details, without setting up account in Exchequer Enterprise. Quotes tracked as forecast sales posted to Goldmine/ACT. Quotes posted as linked documents to Goldmine/ACT. Linked quotes may be opened by double clicking on the quote to open it in the Master Link TeleSales module. Create mail shots to potential customers. Synchronise customer and transaction information to external sites. “We are glad we chose Goldmine and Master Link, we use Goldmine to share information, e-mails and account information about our customers. The TeleSales department use Goldmine to schedule phone calls to our customer base taking orders quickly via Master Link TeleSales Module.” says Toni Guarnieri at Tri-Star Packaging Ltd. The TeleSales module requires very fast access to the Exchequer Database, we therefore recommend that the networks should be a non congested 100MPS network. For more than 4 users (of Exchequer and the Telesales module) use the Exchequer Client Server engine. Exchequer Enterprise SPOP module to enable order processing. 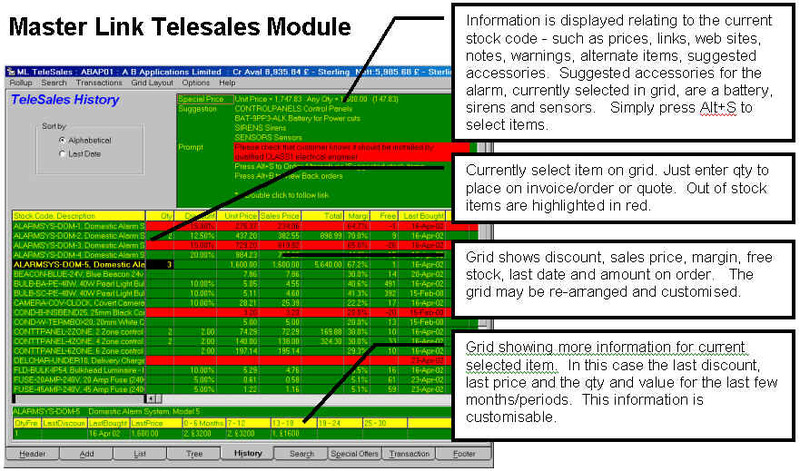 Optionally Master Link and Goldmine (or ACT, or Maximiser) to front the telesales operation. Contact us for a demo copy of Master Link TeleSales. It requires the same number of COM Licenses as the number of Master Link TeleSales users.